Dr. Rani Ramachandran founded aesthetic medicine vlinic to provide affordable skin care in a relaxed, soothing, medical setting to patients. Dr. Ramachandran received her medical degree from University of Madras and a Masters in Public Health from Loma Linda University. She did her medical Residency training at University of California, San Francisco (UCSF) affiliated hospitals and Fellowship at Stanford University. 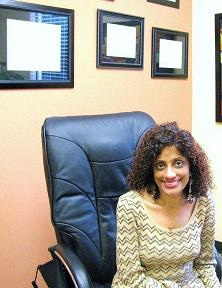 She is board certified by the American Board of Internal Medicine in Infectious Diseases. She is the author of several medical articles and journal papers. She is affiliated with Regional Medical Center and O'Connor Hospital. She has served as Vice-Chair and Chair, Dept. of Medicine at Regional Medical Center. She has also been actively involved in and significantly contributed to the establishment of charitable hospitals in India. Dr. Rani's interests are in fashion and style. These interests, combined with her clinical experience, inspired her to found Rani MD clinic where aesthetic medicine and technology can be effectively used to enhance beauty and inner well being of a person. Her mission is to provide the aesthetic medicine services with a physician's caring and personal touch and rigorous quality.